Our expertise in rough terrain and slope mowing makes AS-Motor the equipment of choice for use in meadow orchards. To preserve the flora and fauna native to certain regions, meadow orchards are typically mowed at longer intervals: once in spring and once in autumn. AS-Motor’s mulching mowers excel at clearing thick growth and high grass, while AS-Motor’s 2-stroke powered machines are ideally suited for maintaining steep areas surrounding the orchards. AS-Motor offers several high grass mowing solutions depending on the cutting force required. A high performance engine is recommended for meadow orchards that will only be mowed once per year. 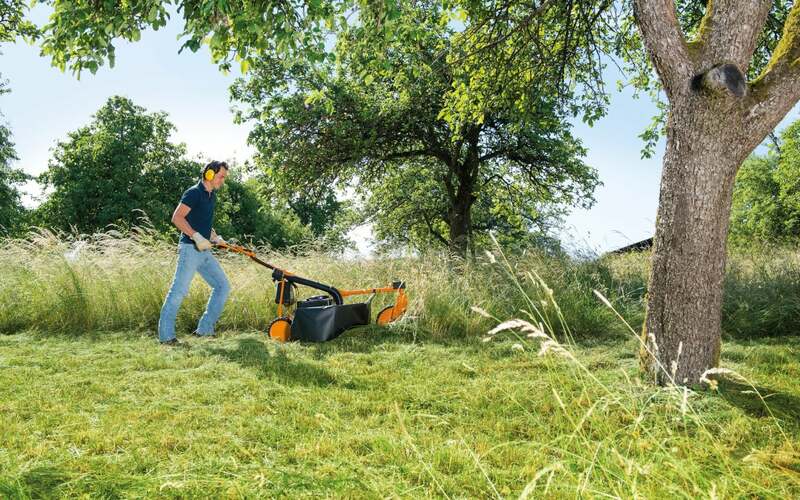 AS-Motor’s smaller machines are suitable for meadows that will be mowed several times per year. Only certain engines are suitable for mowing on slopes. Standard 4-stroke engines can handle inclines below 20 degrees, while specialized 4-stroke engines can work on slightly higher inclines. The best solution for slopes, however, is the AS 165 ES 2-stroke engine which can power a mower safely up inclines that exceed 45 degrees. AS-Motor Allmähers and ride-on mowers are often equipped with special cross-blades and closed mulching mower decks that cut grass several times and generate a fine, uniform layer of mulch that then decomposes as natural fertiliser. This process eliminates the risk of rotten areas in the orchard. Dense growth and fast-growing saplings can quickly encroach onto meadow orchards. AS-Motor’s Allmähers easily tackle dense growth, while AS flail mowers and the AS Sherpa deliver more robust cutting performance. Even my grandmother had an AS mower, which at the time was still red and white and had a front wheel with spokes that looked like a bicycle. And my parents had orchards and vineyards... which could only be mowed a scythe or an AS mower. With our AS 73 4T Allmäher we mow our meadow orchards more than three times faster than we did with a brush-cutter. You cannot tell whether a mower mulches effectively or poorly until after two weeks; at that point, you can see if there are a just few spots or many rotten sections on the mowed area. I would have never believed that the AS 63 2T could mow this embankment with a 38 degree incline, but it does.